After purchasing the Apple Mac Pro for the past month, and loving it so much. I've been spending sleepless nights (ok, I'm kidding... in reality, I have an "off" switch on the back of my head. When it hits the pillow, I'm out) thinking about in the event of a bad electric spike, it can seriously damage my baby. Not to mention, if I run into a blackout during upcoming Summer months, I can lose my files to data corruption, and lose my work which I may have worked on for many hours. The solution is to get a UPS (Interruptible Power Supply) made by APC. Belkin makes several reputable model as well. However, I'm old school with APC from the years of working as a network administrator which we employ APC UPS to power backup network servers. 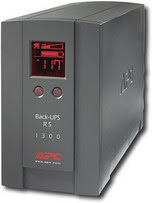 Circuit City had a great deal this weekend with the APC 1300 VA Battery Backup System with LCD Display. The voltage capacity is very important when considering a UPS because depending on the number of device, computer, monitor and peripherals such as external hard drives and external DVD burners, it might be too much of a strain on a more anemic version. 1300 volts protection is just about right because it's affordable yet it can protect all the devices I mention above. It's rated up to 136 minutes of power backup which is ample time for me to save my files and turn off my computer, or enough time for power to recover. Plus, it conditions electric current coming out of the wall to my computer power supply and avoid too high of a spike which can permanently damage my baby. This model has a LCD display which show the status of the electric current and the load it's taking on. As a curiosity, I noticed that the electric current fluctuates from 119 volts to 122 volts throughout the day. It has 8 outlets. 6 of which is battery backup for devices such as monitors, computer, external hard drives. And 2 outlets not backup for devices such as printers, speakers, DVD burners, etc. Just a quick update on 12/9, Circuit City is selling it for $119. I guess I'll make a quick stop to CC and get my $10 + Tax back since it's within 30 days price match period.